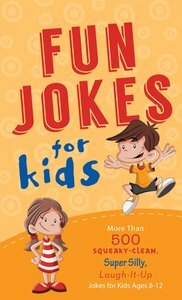 Fun Jokes for Kids contains more than 500 squeaky-clean, super silly, laugh-it-up jokes that kids can tell their grandmas. Jokes are arranged by topic, and each section includes an inspirational introduction that adds just a touch of scripture. Fun Jokes for Kids promises hours of good, wholesome entertainment! About "Fun Jokes For Kids"